How many of you get your gas from GetGo? All of you, right? Why wouldn't you? 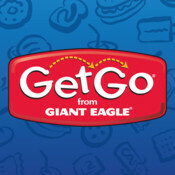 You shop for groceries at Giant Eagle and earn FuelPerks then you get gas at GetGo and earn FoodPerks. It's a never-ending cycle of savings. Plus, I find that I get better mileage from GetGo gas than Sheetz. I have no clue why that's the case, but it is. As awesome as it is, it seems that with every update to the gas pumps GetGo adds more steps to pumping gas. Phew! That was a workout! What's with all of those button presses? Shouldn't they be able to assume certain defaults and only make you press buttons if your answer is in the negative? You'd think so. Actually, I made a little flowchart that fixes this whole mess. 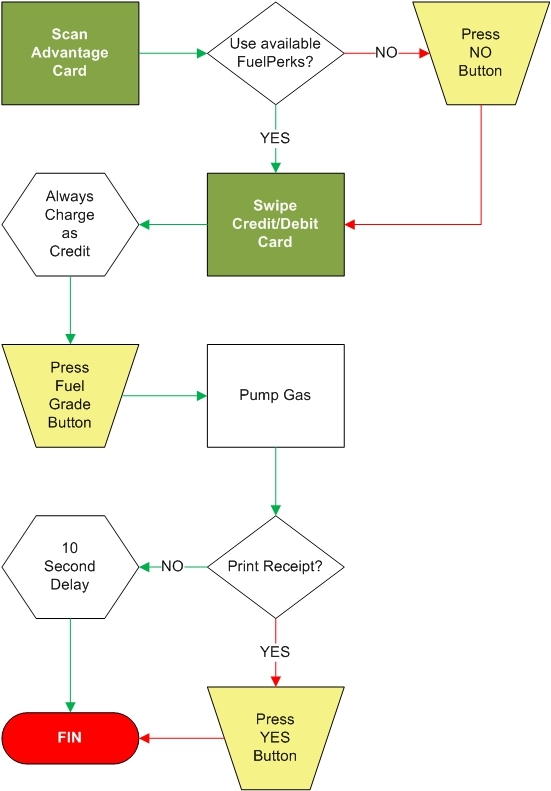 The common case (green lines) only involves a single button press during the entire process. It is only if you choose non-standard choices that you have to press other buttons. Isn't it beautiful? A single button press for the default case. Let's walk through this... First, you have two possible starting points, scanning your Advantage Card if you want to use your FuelPerks or just swiping your payment card if you don't. Let's assume that we want to start from the beginning. I would walk to up the pump and scan my Advantage Card. The screen would tell me that I have $0.20/gallon in FuelPerks. If I want to use it I can just continue by swiping my payment card. There is no need to press a YES button. YES should be inferred by my completing the next step. It is only if I don't want to use them that I have to press the NO button. NOTE: It is MUCH harder to get back your money if someone steals your Debit card and makes fraudulent charges. Because Debit cards are directly linked to your bank account, that money is instantly gee-oh-enn-ee GONE! Credit cards, on the other hand, have the 2-3 day clearing time for charges in addition to the monthly payment cycle within which you can work. Because the money hasn't physically gone anywhere it is easier to recover, unlike Debit cards where your money is immediately physically moved out of your account. Do yourself a favor; cut up your Debit card and only use Credit cards hence forth. If your first thought is that now you have to worry about making payments on time, maybe you shouldn't be allowed to have money in the first place. Next, you press the button for the grade of gas and continue to pump your gas. Once you're done, if you're a normal person who hates receipts, you can just leave. The pump will reset itself in 10 seconds so the next person in line can't do anything malicious like print your receipt or try to pump gas on your dime. If you are a horrible person who loves to kill trees, you can press the YES button within 10 seconds and a receipt will be printed. Credit costs more per transaction than debit so I doubt they do that. Also I don't like the auto accept fuel perks seems like bad human factors. I believe it will reset after 10 seconds for the receipt. Usually the one here asks me if I want a car wash too. SheetZ just has it as an option while you pump. I don't think you can minimize the number of button presses unless you have preselected options on your advantage card.